When I woke up Sunday morning to the sound of heavy rain I must admit I was worried. If it kept raining like this during the run it would mean water logged shoes and heavy wet clothes. Not exactly conducive to PB results! 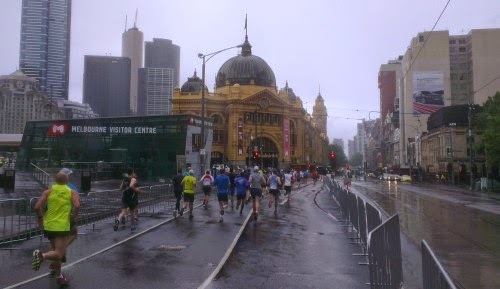 The Bureau of Meteorology's weather radar showed a large swathe of blue covering Melbourne but the good news was that it looked like clearing at some point during the run. Until that happened, I wasn't keen on getting wet so I tried my hand at fashion design and turned a garbage bag into a makeshift rain jacket. According to The Age, almost 12,000 people braved the conditions and ran compared to about 14,000 in 2013. No doubt the heavy morning rain played a part in the reduced numbers. I perform my best in cool, overcast conditions so I was happy to take a bit of rain over a warm, sunny morning. After 3 years of been run as a 14km event, this year the organisers decided to change things up and make it 15km. Rather than starting at the Arts Centre, we would be starting in Yarra Park, better known as the MCG car park. The course would then take in the scenery of Flinders Street, Federation Square and the Arts Centre. The other main difference was at the finish where we no longer had to run up and down a section of Beaconsfield Parade. This was my least favourite part of the old course. 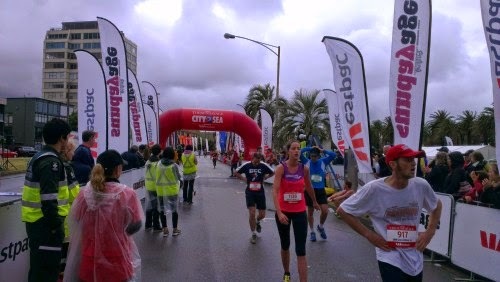 Something about having to run a kilometre past the finish line and back again really irritated me. But now we would come down Fitzroy Street and run directly into the finish at Catani Gardens. Due to my times at previous City2Sea events, I qualified for a start with the Red Wave, the first group of runners released after the elite preferred start group. 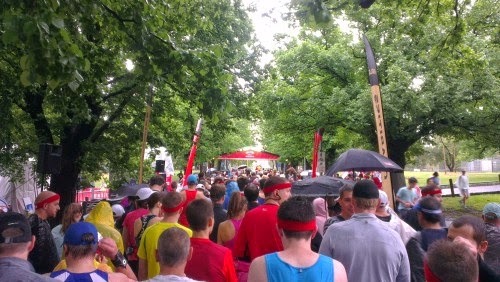 I got to the start line about 15 minutes early and huddled with everybody else under the dripping wet elm trees of Yarra Park. It was cool though not cold. The rain was beginning to ease but it was still heavy enough that I was very glad for my homemade garbage bag jacket. There was the usual pre-race buzz and chatter amongst the field. Everyone was obviously hoping the rain would ease further but overriding sentiment was that these were perfect conditions for a PB. 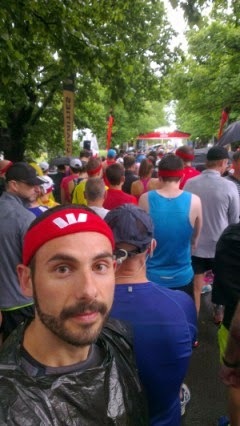 To add to my look I was wearing one of the Westpac headbands that were handed out pre-race. Gotta support the sponsors! I figured it could be handy to keep my face dry but in truth it did go well with the whole garbage bag outfit. 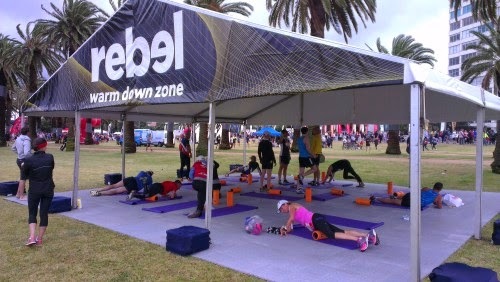 DJ Havanna Brown pumped out the tunes and Jacinta Campbell got the waiting runners doing some warm up callisthenics. Much better than Harry Kewell's efforts at the start line last year! With the rain still falling, I think every runner was thankful when the organisers had us off and running at the scheduled time of 8:20. And what better way to start a run than running downhill! The first 500 metres were all downhill along Wellington Parade South ensuring a fast start that helped set the tone for the rest of my race. With the rain still falling and the temperature cool, I kept the garbage bag on. I must have been quite a sight but I was in good company with other garbage bag clad runners. It didn't seem to be having too much of an impact on my performance though. I was pumping out low 4 minute kilometres and I even managed to take some photos along Flinders Street without losing too much time. The road was obviously very wet and I did see a couple of runners slip but thankfully they managed to stay on their feet. There were puddles everywhere and I tried as best as possible to avoid landing in any big ones. My feet were already wet enough! After coming out from under the Arts Centre and onto Sturt Street the rain had stopped and I was starting to feel warm with the garbage bag still on. I waited until I could see a rubbish bin and then ripped off the bag superman style. Time to kick some arse! Somehow I managed to keep running sub 4:30 kilometres all the way up St Kilda Road. The half way point of the run was at the St Kilda junction and I passed it with barely 30 minutes gone on the clock. I was flying along and must admit I was surprised with the pace I was managing to maintain. In general I train on very undulating courses with lots of hills where I struggle to run anywhere near 4:30 pace so this was feeling easy in comparison. But how long could I keep this up? 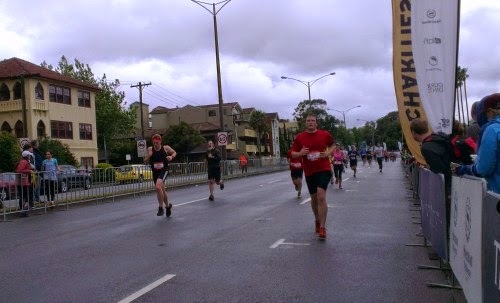 The way I faded out in the Melbourne Marathon after a fast first half was still fresh in my mind. But when I realised there was only 7.5km to go and I was feeling good any doubts were banished. 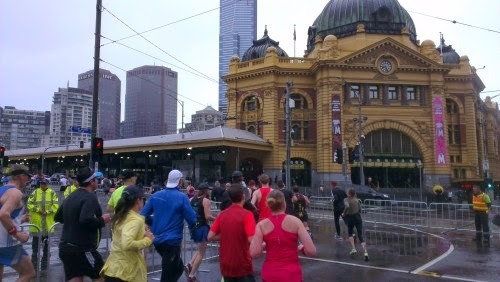 This was a very different race to the Melbourne Marathon. It was obviously a shorter, far easier course. The conditions were cooler and the Sun was absent. Plus, since the Melbourne Marathon, I had put in a lot of long interval training sessions and those long undulating courses had obviously made my body a lot stronger. My legs were ready to be pushed hard. Today I was going to smash it! There was entertainment all along the course, although this year it seemed a little sparse compared to previous years. Maybe because of the rain or the extra kilometre? My favourite was the lone guy with his guitar who was playing on Lakeside Drive. I'm not even sure the he was actually part of the official entertainment! Also kudos to the band of young boys along Albert Road Drive. The mist tent was back again this year although understandably it was not very popular! It was funny watching the volunteers trying to encourage runners to run through. As usual the other volunteers at the drink stations and the sponsor groups like Nova and Westpac did a great job cheering the runners on. I do remember having a chuckle a few times after passing some of them and I took as many high fives as possible! 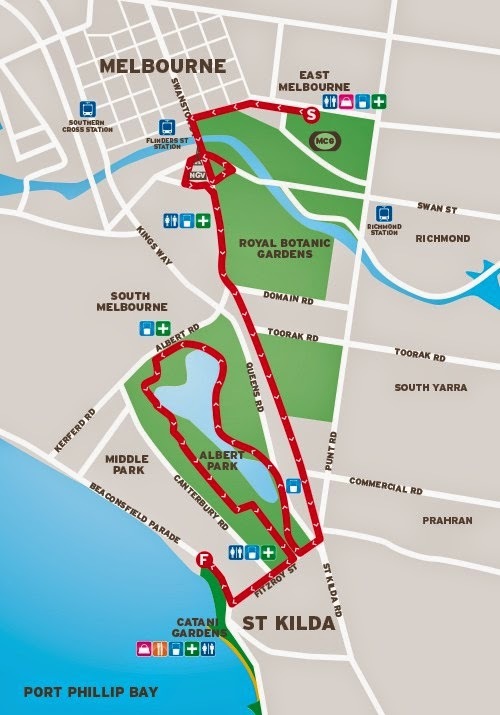 The only real challenge came after reaching the northern most tip of Albert Park at the 11km mark and then turning south. We were running into a slight southerly headwind and I did back off my pace for a little bit to adjust. But with only a few kilometres to go until the finish, I eventually threw caution to the wind and went for it. 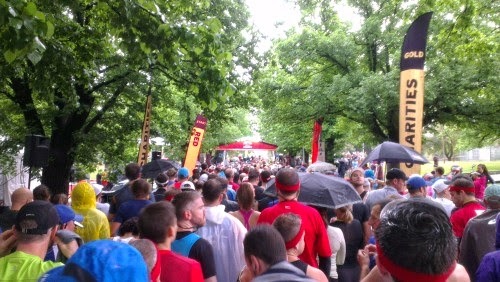 Exiting Albert Park and running down the Fitzroy Street hill towards the finish at Catani Gardens was an absolute thrill. I didn't have the pace I was hoping for but I pushed as hard as I could towards the finish line. Given the conditions, there was a reasonable crowd of supporters waiting to cheer on loved ones as they finished. I looked at the clock at the finish and could see it was still in the 64th minute. That was an incredible run! I punched the air as I ran through, satisfied I had run a good race and given it everything. 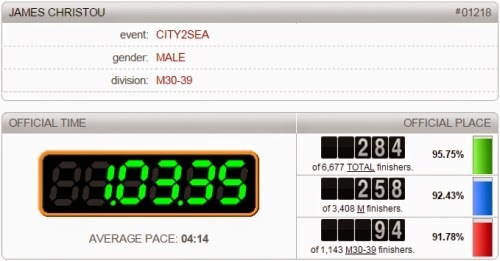 It turned out I was the 284th finisher to cross the line putting me inside the top 5% of all runners! What's more I managed an official time of 1:03:35, more than a minute faster than last year, even with the extra kilometre we had to run! It was definitely the best run of my short running career so far. 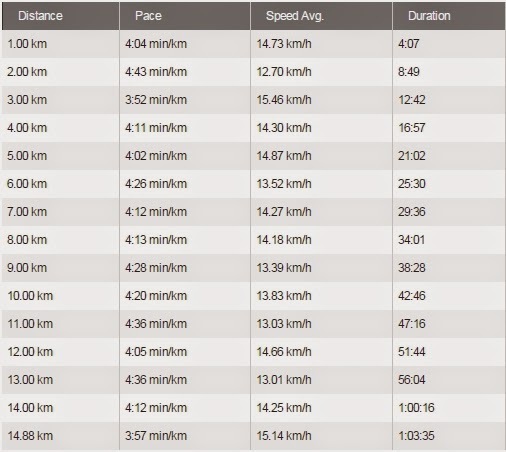 I don't think I could have run a better race and I was very happy with the consistency of my race splits. I'd kept a great pace through the whole run and I can honestly say that I didn't have much gas left in the tank when I crossed the line. In all honesty, I owe my time to the conditions which were peach perfect for me. I only felt a slight wind around Albert Park and the temperature and humidity were just right. In contrast, tonight I went for a run in 30C heat and I blew up and had to have a walking break after 5km! Finishing so high up in the places meant that there was hardly anyone around in the post race village which was great. I quickly got my participants medal, which looks awesome by the way, and then went over to the Rebel Sports recovery tent where I used the foam rollers they had made available to massage and recover. A great idea that I hope to see at more fun runs in the future! 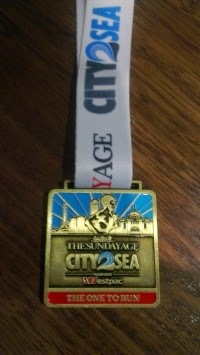 My participants medal. Love it! I caught up with my mate Mark (we ran the Melbourne Marathon together) who had started in the Green Wave and finished with a sub 70 minute time and we grabbed a well earned post race recovery brunch. I'm already looking forward to next year's installment of what has become my favourite running event. Hopefully everyone else had a great run and the organisers stick with the new and improved course. I'm obviously a massive fan of the changes! With another year of training under my belt I'm sure I can go even faster so watch out next year! Btw, special thanks to my wife who got up early to drop me off and then drove to St Kilda to wait for me with a change of clothes. Early morning fun runs are a lot more difficult without such support! My next race, and last one for the year, is the 10km Coburg Lake Classic this Sunday. Looking forward to seeing if I can run sub 44 minutes on a tough undulating course. Happy running everyone!